In recent years, timber skyscrapers have been continually touted as one of architecture’s most exciting frontiers. 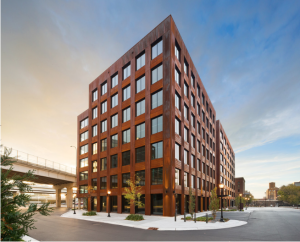 The most fervent supporters of tall timber architecture push for a world in which steel and concrete fall to the wayside due to their steep environmental costs. This crucial decline would make room for wood to rise to unprecedented heights, and occupy new roles in the structural makeup of buildings. But how does timber really measure up? Wood is a renewable resource that is less energy-intensive to extract than those construction giants, concrete and steel. Once extracted, it also requires reduced energy to process raw logs into engineered wood — a material form that can be easily harnessed for construction. Finally, and perhaps most interestingly, the emissions that are naturally absorbed into trees through process of photosynthesis continues to be sequestered in the building’s wood fibers throughout its lifespan. This means that if built right, architecture can serve as a carbon sink for as long as it stands. In this collection, take a look at three spectacular structures that serve as game changers in the realm of mass timber construction.